My son turned 5 last week. If you are a regular reader here you would know that he loves chocolate and I have made Eggless Chocolate Cupcakes with Homemade Rainbow Sprinkles, Chocolates in Tool Shape, Eggless Sachertorte earlier for his birthday. This birthday was no different. He opted for chocolate cake only! I chose the recipe from Barbara Bakes. She has a recipe for a mini 4” pan cake. Since I don’t have a 4” pan I used a mini bundt pan. Upon baking I realised that even my bundt pan was bigger for the recipe. So I baked a 2nd cake after doubling the recipe. I kept the recipe same, made minor changes of reducing sugar, using apple cider vinegar & orange essence. I felt the batter was too thick, so added 1 Tbsp milk to bring to desired consistency. 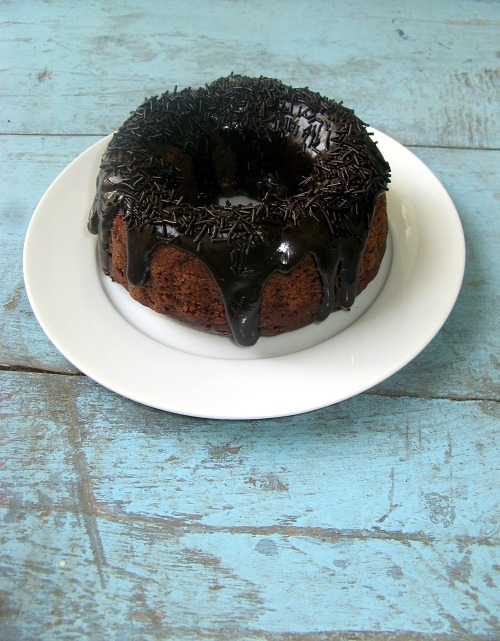 I covered it with more chocolate goodness – Ganache & then topped it with chocolate sprinkles. The taste was moist and chocolatey. My son as well as daughter were happy and that’s what I wanted! A mini bundt cake for little ones. Preheat oven to 180 C. Grease & dust a mini bundt pan. Whisk together water, oil, vinegar, and orange in a cup. Add to dry ingredients and whisk just until combined. Bake 20 - 25 minutes or until a tester comes out clean.